Crop quality is important to fruit and vegetable growers, buyers, and handlers. °Brix readings indicate soluble solids content. Since soluble solids represent a product's potential sweetness (an aspect of quality), °Brix readings can interest many throughout the value chain. Three steps are required to make effective use of °Brix readings: (1) obtain accurate representative values; (2) become familiar with other representative values for similar crops; and (3) if needed, adjust management practices according to how they may affect °Brix values of your crops, using proven approaches. Four fact sheets have been prepared to guide vegetable farmers, buyers, and handlers in using °Brix as an indicator of crop quality. This Linking fact sheet provides reference information on representative °Brix values and how they are influenced by crop management. Equipped with this information, vegetable suppliers should be better prepared to make effective use of °Brix measurement in their operation. However, the Overview fact sheet provides important background information on °Brix, outlines its application in horticultural crop production, and describes the benefits and limitations of measuring °Brix during vegetable production and marketing. Two other fact sheets provide specific instructions for the taking of °Brix readings in five vegetable crops. °Brix values are relatively straightforward to measure and are readily available. However, few people appear to be familiar with values that would be "typical" for their crop. Reference values are available in government and scientific reports and other documents. However, ultimately, the most important values for most vegetable growers, buyers, and handlers may be the "bank" of numbers they develop in their own operation over time through consistent, conscientious measurement. Nevertheless, in this fact sheet, we present three sets of reference °Brix values. The first set (Table 1) includes examples of soluble solids values that are used as criteria in official USDA fruit and vegetable quality grades. In certain fruiting crops (i.e., cantaloupe, watermelon) soluble solids levels obtained with an approved refractometer influence the official grade to which the crop is assigned. For example, based on the chart below, °Brix values less than 9% and 8% in cantaloupe and watermelon, respectively, mean that the crop cannot be labeled as having "good internal quality" by USDA standards. Table 1. Examples of USDA crop grading standards which incorporate soluble solids values. The second set of reference °Brix values (Table 2) was taken from published agricultural research. This set includes values reported on multiple crops grown in research plots in many locations. Keep in mind that these plots were managed differently: growing system, nutrient and irrigation regime, and variety differed from one experiment to another. Because of this variation, numbers in Table 2 do not necessarily represent target values. That said, the research was usually conducted to study the influence of genetic and production factors on crop quality. And, the research often involved commercial-like practices and common varieties. Therefore, it is reasonable for growers and others to observe similar °Brix values in their business. Table 2. Examples of soluble solids (°Brix) values from published agricultural research reports across a variety of crops and locations. The third set of reference °Brix values (Table 3) was created in Ohio during the completion of a project supported by The Ohio State University/OARDC/OSU Extension, the Department of Horticulture and Crop Science, the Warner Endowment Fund for Sustainable Agriculture, and area farmers. With this support, the Ohio State University Vegetable Production Systems Laboratory obtained hundreds of °Brix readings on station- and farm-grown vegetable crops from twelve locations in 2011. Crops were grown conventionally and organically and most of the data were collected by growers using handheld digital refractometers as described in two fact sheets in this series. The values in Table 3 were developed in 2011 only. They may or may not represent values expected in your operation. Contact Matt Kleinhenz for more information on these values. Table 3. 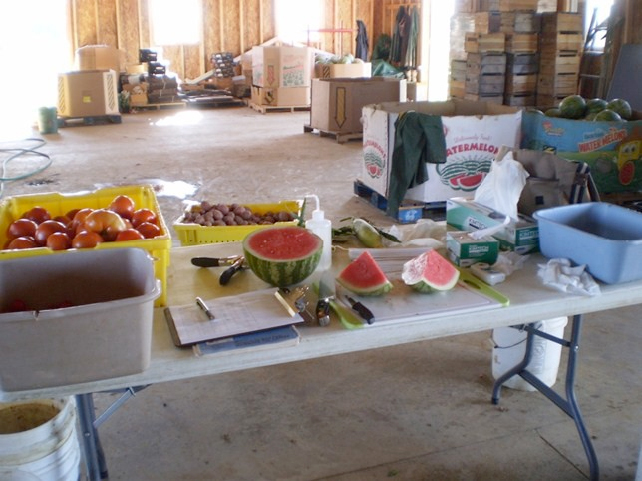 Soluble solids (°Brix) values gathered during an on-farm research project carried out in Ohio in 2011. In the tables above, the reported °Brix values for individual crops displayed wide ranges (e.g., in Table 3, 2.9–15.7 for bean and 9.5–26.5 for sweet corn). These ranges are due to the fact that at any one time, many factors influence a vegetable crop's condition and, therefore, its °Brix level. Going forward, vegetable suppliers interested in having their crops achieve target °Brix values will benefit from being familiar with these factors and how they can be manipulated. Variety selection, crop maturity, crop physiology or metabolism, and major abiotic components of the growing environment (e.g., moisture, fertility, light, and temperature) are known to influence °Brix levels. Variety selection and crop maturity, metabolism, and water status tend to have direct and often significant and immediate impacts on vegetable °Brix levels. In contrast, soil and crop nutrient status and environmental light and temperature levels appear to have more indirect and subtle effects on vegetable °Brix values. The following is a brief summary of some of the specific effects of various factors on vegetable °Brix levels. Information given in this section is supported by articles cited in the References section and farmer experience. Weather effects on soluble solids levels begin at planting and continue through harvest, in part because planting and harvesting dates determine the environmental conditions under which crops grow and mature. Environmental conditions that most strongly influence crop quality and °Brix include sunlight, temperature, and moisture. Exposure to various combinations of these conditions due to planting and harvest schedules can influence elements of quality (including °Brix) and flavor in field- and greenhouse-grown crops. These conditions influence the amount of soluble solids (mostly sugars) that are in marketable leaves, stems, fruits, tubers, roots, etc., at any one time. These factors influence °Brix levels alone and in combination. For example, temperature and light interact to set the rate of sugar production, but temperature may have a stronger influence on tomato fruit soluble solids content than sunlight. Weather, planting and harvesting dates, and some soil characteristics often cannot be altered significantly. Often, vegetable growers must adhere to certain planting and harvesting windows. Also, they can only establish protective microclimates around crops (e.g., using mulches, films, or low or high tunnels) which lessen the more radical effects that temperature, moisture, and other extreme conditions can have on crop quality. Likewise, soil amendments can increase soil organic matter or alter other soil properties, thereby creating growing conditions more conducive to crop health and quality. Yet, some steps to limit environmental fluctuations or enhance soil quality may be unavailable to some farmers. Moreover, the effects of these steps on crop quality in the near-term may be indirect. Therefore, vegetable growers may prefer to take easy steps proven to have immediate and significant effects on quality, perhaps especially °Brix. Steps in this category include proper variety selection, water and fertility management, and planting and harvest timing. All things being equal, varieties of the same crop tend to differ in their baseline °Brix level. That is, varieties have a natural inclination toward lower or higher levels of soluble solids within the portion that is marketed. Therefore, variety selection is one of the most important and direct methods of shaping °Brix and crop quality. If °Brix is important to you, consider discussing varietal tendencies with seed suppliers and reviewing other data on varieties. Product quality begins with variety selection. Regardless of variety, soluble solids levels track crop maturity. All vegetable crops undergo changes in their makeup through their lifetime, regardless of what the farmer does. Sweet corn kernels turning from milky and sweet to dry and starchy is one example of the natural, pre-programmed crop maturation process. So, crop stage and harvest timing, in particular, strongly influence crop quality and °Brix levels. In fact, the degree of ripening at harvest influences the full chemical makeup of the fruit or immature seed and, therefore, its flavor and texture. Soluble solids and sugars tend to increase during ripening, while acids tend to decrease. When tomato fruit are harvested at a very early stage of ripening, the combination of sugars, acids, and volatile compounds related to flavor may be sub-optimum. That said, some fruit and seed continue to mature after picking. And, they may be more susceptible to physical damage during post-harvest handling if picked table-ripe. Regardless, it is clear that harvest timing is important to all growers and that measuring °Brix values can help determine harvest- and market-readiness in some crops. Irrigation timing or soil moisture levels also affect °Brix but in ways that may complicate management decisions. For example, reduced water availability during fruit development can increase fruit soluble solids content but lower total fruit yield. So, growers must balance the opportunity to enhance the quality of their fruit with the potential to reduce the yield of them using the same practice. In dry areas where water availability can be carefully controlled, precise irrigation has been able to increase °Brix and maintain acceptable yields. High tunnel growers may be able to balance yield and quality most effectively through irrigation and fertility management. Indeed, the influence of fertility programs on °Brix is becoming clear. Increased fertilizer or salinity levels (i.e., higher electrical conductivity levels) in irrigation water are reported to increase °Brix levels in greenhouse-grown tomato and pepper. Mineral fertilization can also influence volatile compounds and fruit flavor. In addition to electrical conductivity, there is evidence that nitrogen (N) nutrition can affect °Brix levels but in an indirect and complex manner. Nitrogen availability can impact the efficiency of photosynthesis through which sugar is created and, therefore, possibly alter soluble solids levels. However, excess N can also slow maturation and reduce sugar and acid content. Effects on soluble solid content in tomato were measured on 8/24/07 in Gödöllõ, Hungary. Treatments were unirrigated (1), unirrigated with K application (2), irrigation up to 30 days before harvest (3), irrigation up to 30 days before harvest with K application (4), standard irrigation (5), and standard irrigation with K application (6). Columns bearing the same letter are not significantly different. Vertical bars represent significant differences at p = 0.05, n=4. 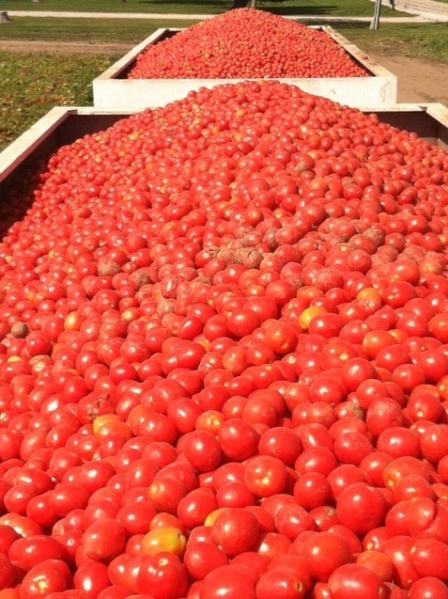 °Brix levels are a common metric used to describe the quality and suitability of processing tomatoes (Image courtesy of Hirzel Canning Company and Farms, Toledo, Ohio). Production factors such as temperature and light levels and soil moisture and fertility status influence crop °Brix levels. These factors differ with regard to the amount of control field and high tunnel growers have over them. These factors also differ with regard to the apparent, direct impact they have on °Brix, based on scientific evidence and grower experience. Biological factors such as variety and crop maturity affect soluble solids levels strongly; growers select varieties but have little control over maturity outside of harvest timing. Controlled-environment greenhouse production involves a greater amount of control over factors that influence crop growth, yield, and certain aspects of quality than field production. Overall, the greenhouse industry continues to pay close attention to the effects of variety selection and crop management on °Brix. Also, adjustments in management regimens to optimize °Brix and other characteristics are generally more feasible in greenhouse than field settings. Farmers working with soils in more dynamic and unpredictable open field and high tunnel settings have an opportunity to gain from what is discovered in greenhouse production and research. More important, field and high tunnel vegetable growers can learn from their own tests of the relationships between management and °Brix and other aspects of crop quality. This four-part fact sheet series is designed to assist them in that process. Aldrich, H.T., K. Salandanan, P. Kendall, M. Bunning, F. Stonaker, O. Kulen, and C. Stushnoff. 2010. Cultivar choice provides options for local production of organic and conventionally produced tomatoes with higher quality and antioxidant content. J. Sci. Food Agr. 90:2548–2555. Anza, M., P. Riga, and C. Garbisu. 2006. Effects of variety and growth season on the organoleptic and nutritional quality of hydroponically grown tomato. J Food Qual. 29:16–37. Arias, R., T.C. Lee, D. Specca, and H. Janes. 2000. Quality comparison of hydroponic tomatoes (Lycopersicon esculentum) ripened on and off vine. J. Food Sci. 65:545–548. Aulenbach, B.B., and J.T. Worthington. 1974. Sensory evaluation of muskmelon: Is soluble solids content a good quality index? HortScience 9:136–137. Barrett, D.M., C. Weakley, J.V. Diaz, and M. Watnik. 2007. Qualitative and nutritional differences in processing tomatoes grown under commercial organic and conventional production systems. J Food Sci. 72:C441–C451. Beverly, R.B., J.G. Latimer, and D.A. Smittle. 1993. Preharvest physiological and cultural effects on postharvest quality. p. 73–98. R.L. Shewfelt, and S.E. Prussia (eds). In: Postharvest handling: A systems approach. Academic Press San Diego, CA. Blaesing, D., A. Murray, M. Schulz, and M. Stewart. 2006. Nutrient management for high soluble solids production in Australian processing tomatoes. Acta Hort. 724:75–83. Bumgarner N., J.C. Scheerens, R.W. Mullen, M.A. Bennett, P.P. Ling, and M.D. Kleinhenz. 2012. Root-zone temperature and nitrogen affect the yield and secondary metabolite concentration of fall and spring-grown, high density lettuce. J. Sci. Food Agr. 92:116–124. Chassy, A.W., L. Bui, E.N.C. Renaud, M.V. Horn, and A.E. Mitchell. 2006. Three-year comparison of the content of antioxidant microconstituents and several quality characteristics in organic and conventionally managed tomatoes and bell peppers. J. Agr. Food Chem. 54:8244–8252. Crisosto, C.H., and J.P. Mitchell . 2002. Preharvest factors affecting fruit and vegetable quality. p. 49–54. In: A.A. Kader (ed). Postharvest technology of horticultural crops, 3rd Ed. Univ. Cal. Agr. Nat. Res. Pub. 3311. Davis, A.R., C.L. Webber, P. Perkins-Veazie, and J. Collins. 2006. Impact of cultivar and production practices on yield and phytonutrient content of organically grown watermelon. J. Veg. Sci. 12:83–91. Fleisher, D.H., L.S. Logendra, C. Moraru, A.J. Both, J. Cavazzoni, T. Gianfagna, T.C. Lee, and H.W. Janes. 2006. Effect of temperature perturbations on tomato (Lycopersicon esculentum Mill.) quality and production scheduling. J. Hort. Sci. Biotechnol. 81:125–131. Gazula, A., M.D. Kleinhenz, J.G. Streeter, and A.R. Miller. 2005. Temperature and cultivar effects on Anthocyanin and chlorophyll b concentrations in three related Lollo Rosso lettuce cultivars. HortScience 40:1731–1733. Gills, L.A., A.V.A. Resurreccion, W.C. Hurst, A.E. Reynolds, and S.C. Phatak. 1999. Sensory profiles of carrot (Daucus carota L.) cultivars grown in Georgia. HortScience 34:625–628. Hale, T.A., R.L. Hassel , and T. Phillips. 2005. Refractometer measurements of soluble solid concentration do not reliably predict sugar content in sweet corn. HortTechnology 15:668–672. Helyes, L., J. Dimeny, Z. Pek, and A. Lugasi. 2006. Effect of the variety and growing methods as well as cultivation conditions on the composition of tomato (Lycopersicon lycopersicum (L.) Karsten) fruit. Acta Hort. 712:511–516. Hornick, S.B. 1992. Factors affecting the nutritional quality of crops. Amer. J. Alt. Agr. 7:63–68. Johnstone, P.R., T.K. Hartz, M. LeStrange, J.J. Nunez, and E.M. Miyao. 2005. Managing fruit soluble solids with late-season deficit irrigation in drip-irrigated processing tomato production. HortScience 40:1857–1861. Kleinhenz, M.D., and A. Wszelaki. 2003. Yield and relationships among head traits in cabbage as influenced by planting date and cultivar. I. Fresh market. HortScience 38:1349–1254. Krauss, S., W.H. Schnitzler, J. Grassmann, and M. Woitke. 2006. The influence of different electrical conductivity in a simplified recirculating soilless system on inner and outer fruit quality characteristics of tomato. J. Agr. Food. Chem. 54:441–448. Lamont, W.J. 2005. Plastics: Modifying the microclimate for the production of vegetable crops. HortTechnology 15:477–481. Lester, G., and K.C. Shellie. 1992. Postharvest sensory and physicochemical attributes of honeydew melon fruits. HortScience 27:1012–1014. Pardo, J.E., R. Gomez, J. Tardaguila, M. Amo, and R. Varon. 1996. Quality evaluation of watermelon varieties (Citrullus vulgaris S.). J. Food Qual. 20:547–557. Peet, M.M., C.D. Harlow, and E.S. Larrea. 2004. Fruit quality and yield in five small-fruited greenhouse tomato cultivars under high fertilization regime. Acta Hort. 659:811–818. Pluda, D., H.D. Rabinowitch, and U. Kafkafi. 1993. Pepino dulce (Solanum mirucatum Ait.) quality characteristics respond to nitrogen nutrition and salinity. J. Amer. Soc. Hort. Sci. 118:86–91. Radovich, T.J.K., M.D. Kleinhenz, J.G. Streeter, R. Miller, and J.C. Scheerens. 2005. Planting date affects total glucosinolate concentrations in six commercial cabbage cultivars. HortScience 40:106–110. Renquist, A.R., M.J. LaGrange, B.P. Searle, and J.B. Reid. 2005. Towards a control theory for acidity of vegetable crops. Acta Hort. 694:463–469. Riga, P., M. Anza, and C. Garbisu. 2008. Tomato quality is more dependent on temperature than on photosynthetically active radiation. J. Sci. Food Agr. 88:158–166. Simon, P.W. 1985. Carrot flavor: Effects of genotype, growing conditions, storage, and processing. p. 315–328. In: H.E. Pattee (ed). Evaluation of quality of fruits and vegetables. AVI Publishing Company. Westport, CT.
Stevens, M.A. 1985. Tomato flavor: Effects of genotype, cultural practices, and maturity at picking. p. 367–386. In: H.E. Pattee (ed). Evaluation of quality of fruits and vegetables. AVI Publishing Company. Westport, CT.
Tandon, K.S., E.A. Baldwin, J.W. Scott, and R.L. Shewfelt. 2003. Linking sensory descriptors to volatile and nonvolatile components of fresh tomato flavor. J. Food Sci. 68:2366–2371. Thybo, A.K., M. Edelenbos, L.P. Christensen, J.N. Sorensen, and K. Thorup-Kristensen. 2006. Effect of organic growing systems on sensory quality and chemical composition of tomatoes. LWT 39:835–843. Wang, Y.T., S.W. Huang, R.L. Liu, and J.Y. Jin. 2007. Effects of nitrogen application on flavor compounds of cherry tomato fruits. J. Plant Nutr. Soil Sci. 170:461–468. Wang, Z.H., S.X. Li, and S. Malhi. 2008. Effects of fertilization and other agronomic measures on nutritional quality of crops. J. Sci. Food Agr. 88:7–23. Wells, O.S., and J.B. Loy. 1993. Rowcovers and high tunnels enhance crop production in the northeastern United States. HortTechnology 3:92–95. Weston, L.A., and M.M. Barth. 1997. Preharvest factors affecting postharvest quality of vegetables. HortScience 32:812–816. Wright, D.H., and N.D. Harris. 1985. Effect of nitrogen and potassium fertilization on tomato flavor. J. Agr. Food Chem. 33:355–358. Wszelaki, A., and M.D. Kleinhenz. 2003. Yield and relationships among head traits in cabbage as influence by planting date and cultivar. II. Processing. HortScience 38:1355–1259. Zerbini, P.E. 2008. Role of maturity for improved flavor. p. 180–199. In: B. Bruckner and S.G. Wyllie. (eds). Fruit and vegetable flavor—Recent advances and future prospects. Woodhead Publishing Limited. Cambridge, England. The technical contributions of Stephanie Short and Danae Wolfe in the development of this fact sheet are appreciated.